For over one hundred years, Christians have gotten up and gone to bed with Charles Spurgeon's devotional Morning and Evening as a companion. With a reading to begin and end each day throughout the year, you will come to appreciate Spurgeon's emphasis on the importance of abiding in Christ and meditating on God's Word. His wisdom and counsel provide a timeless guide through the trials and triumphs of the year. The richness of his biblical understanding offers readers a look into the heart of one of England's foremost pastors and enduring Christian authors. 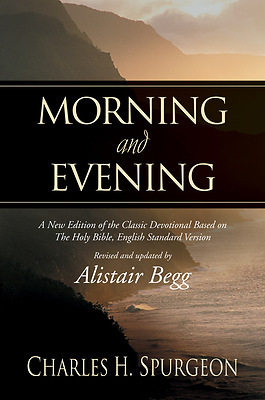 His lasting message is even more accessible with Alistair Begg's careful modernizing of Spurgeon's English. Begg, who has a deep love for Spurgeon's preaching and especially for this work, has maintained Spurgeon's clear passion and commitment to Christ. Using the English Standard Version as the scriptural text provides an accurate, understandable accompaniment to Spurgeon's lessons. This updated version of a devotional classic is a timely and much-needed encouragement for today's Christian.